Doom 3 BFG Ultimate is a modification for the Doom 3 BFG Edition with better visuals, high resolution textures, high poly models, new effects and lightning, challanging enemies (they move faster, are more agile and dodge a lot) and modified weapons with more credible ammocount, recoil, firerates, bullet velocity and muzzleflash lightning. You can download version 1.0 over a moddb.com. Patches 2.0 to 2.2. Added particles and decals that come up missing in mods. 2.1 included. More model work increasing polys on the Imps head and a bunch of level characters like Helldoll. Did a bunch of ROE models also. Increase weapon textures to 1024x1024 and double ROE monster textures and detail on ones that needed it. Includes a Autoexe.cfg with Resource priority set to 0, should speed up load times a bit. Unzip into your Doom 3 BFG directory. patches are accumulative, so 2.1 is included. If you don't have version 2.0, you can download it here. You can get the 2.2 patch here (no longer avaialble) or also download a larger file with the generated folder so you don't need to generate the binary assets yourself. 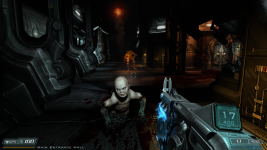 Doom 3 BFG HiDef adds custom hi quality Doom 3 assets to the BFG edition to improve the look of the game. EDIT: 2.2 patch has been supersceded by a full download of 2.2 here. The 2.2 patch with the generated folder is still availble. Several days ago IqeBrowser 2.11 was released. Apparently a memory access violation crept in there so a new version was release. If you got the previous one, download 2.12 & replace the old one. IqeBrowser is a program to open and modify various 3D model formats for export to the Inter Quake Model format (IQM or IQE). You can see a video if it in action below. What is IqeBrowser? IqeBrowser is a program to browse IQE, IQM (Inter-Quake Model format) and many other 3D models. Any 3D model can be saved as IQM (a binary format) or IQE (a text format) file. Some model processing tools are integrated to resize, shift, rotate, reskin ... the model and also to create/ modify skeletons or animations. IQM/IQE is a format supported in the Darkplace engine (Quake) and Yet Another 3D Adventure Game (Quake 2). The latest feature is animation re-targeting, so you can take (for example) a walk animation from one character and apply it to another character. You can download the latest version from moddb.com and be sure to check out the authors project YA3DAG! 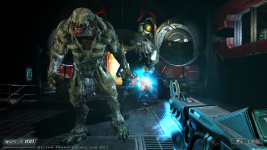 Another version of Doom 3 BFG Hi Def has been released. D3BFG-HD takes many of the non-BFG Doom 3 high quality add ons and makes them D3BFG compatible in a single mod. I don't own D3BFG so I can't check it out but it seems to deliver! You can get the latest over at moddb.com. You'll need the 2.0 version and then the patch. Some mods for it have also been added to moddb.com. The author also wrote some tutorials about RBDoom3bfg, the GPL tweaked D3 BFG engine. There's a “Troubleshooting” and “Modding, What to Know”. last night was group screenshot time on the SPS servers with different MCS "Delta Squad" personnel shots taken at different locations throughout the MCS facilities. The point was to showcase MCS's versatility in terms of player models and locations choice. Also in order to be able to announce and communicate live streams of the latest MCS development builds more efficiently to you, a Twitter Account has been created that you can follow. That way shortly before a stream goes live, every follower will be notified on time. Simply visit and follow my Twitter Account to never miss a live MCS broadcast again. You can view more information about Mars City Security on their Moddb.com page. D3 MCS: Mars City Security is a Doom3 Modification that puts heavy emphasis on cooperative and adversarial multiplayer, merging the fast and addictive gameplay of the predecessors (Doom1 & Doom2) with the enhanced Doom3 technology (optimized netcode, improved idtech4 unified rendering). The first estimated release date is the end of October 2015. At last, the long awaited RetroJam3DLC is finally here! The pack contains three devilish Runic/Vertical maps by Ionous, negke and skacky, as a continuation of RetroJam3's theme. retrojam3dlc_ionous requires Quakespasm or other BSP2 supporting engine. Thanks Func_Msgboard for posting about this! Jackhammer is an id Tech 2/3 engine map editor. It currently supports Quake, Quake 2, Quake 3 Arena, Half Life, and Gunman Chronicles. The latest version includes several near features including: loading models and sprites from pak/pk3 files and reloading a model from disk without reloading the editor. Click Read More to see the whole changelog. It comes in Windows and Linux flavors, 32/64bit. You can download it from the Jackhammer website. Thank's Func_Msgboard for the heads up.